If your overdrive isn’t quite cutting it, and distortion doesn’t seem to hit the spot either, a fuzz pedal might be what you’re looking for. 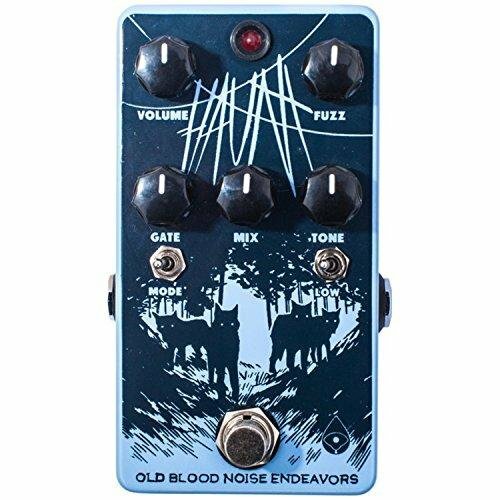 Whereas overdrive provides a very subtle gain boost, and distortion saturates your guitar’s signal by adding a high distortion, fuzz takes your signal and makes it clip so hard that your original sound is almost unrecognizable. These awesome pedals can produce violin-like sustain, giving your guitar licks the power they deserve. In this article we’re going to examine these pedals closely; what they do, the key considerations you need to make when purchasing one, and which products on the market are worth looking at. If you’re in a rush, here’s a quick overview of the products we review further down the article. Ok, let’s get stuck into the meat of the article. Here’s what we cover. What is the Fuzz Effect? 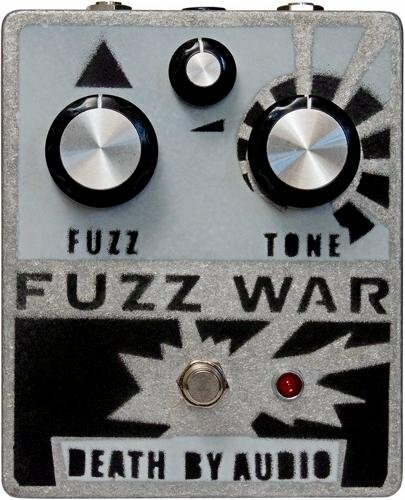 What started as a faulty connection on a mixing board gave birth to fuzz – the effect that defined the sound of rock guitar. It works by completely clipping your signal so that it compresses the distortion. The sound is as though you’ve turned your amp up so high that it’s broken. To get this effect, they use transistors to add gain to your signal which adds harmonics to your sound as soon as it is amplified. The electronics can be germanium or silicon; those made of germanium generally offer a warmer tone whereas silicon produces a brighter effect. As we’ve already mentioned, the main reason people use them is to make their guitars sound dirty. These pedals venture where distortion daren’t and creates sounds that overdrive wouldn’t dream of. If you have some killer single-note riffs, that you need to stand out and screech as they’re saturated in filth, these are your ticket. 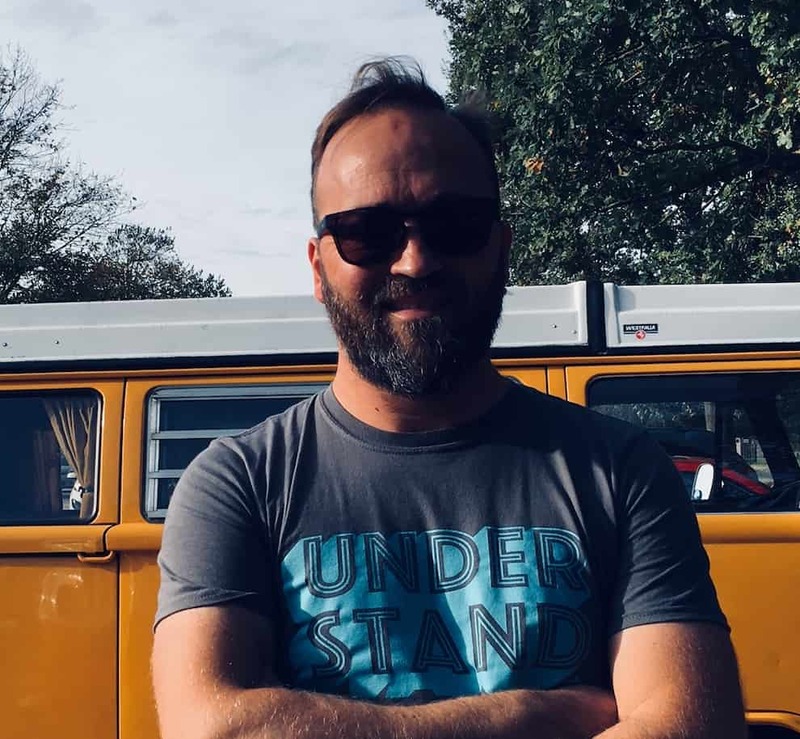 They also offer incredible amounts of sustain – you can hold feedback-drenched notes on for an incredibly long time as they play as though they can’t stop. Of course, most have an option that lets you reduce this amount of sustain, but it’s exactly what some players want. Finally, if you’re into your 60s or 70s rock sound and want to emulate the sound of some of the classics, these are essential. If you want the squealing distortion of Hendrix’s ‘Star Spangled Banner,’ or The Stones’ riff on Satisfaction, and countless others, you’ll love them. There are a few things to consider before you rush out to buy one of these, however. There are two main kinds: those that use germanium transistors and modern alternatives which use silicon. The germanium variety get you a more ‘vintage’ tone and are typically warmer, rounder sounding pedals. The one downside is, they’re prone to be unreliable (in terms of tone) as no two sound exactly the same. Silicon-based ones, on the other hand, are a newer design, and much more predictable in terms of tone. They are cheaper to build than germanium transistors which is one of the reasons they’re so popular, and they create a purer signal which is brighter and more defined. Many people prefer silicon to germanium due to its reliability and punchiness. There are some hybrid options which let you toggle between germanium and silicon settings, allowing you to effectively have both effects in one box. Some of these products include a noise gate feature. Gates allow you to set a threshold under which sounds are not allowed through. When you’re distorting everything that comes through your signal to the max, a gate can help you to ensure that nothing unwanted is getting maximized in this way. If you want a bit more control over the feedback you’re creating, it might be worth looking out for this feature. Again, this comes down to how much control you need. EQ can be covered externally, as can a gate as we saw above, but you might need to shape the sound that’s actually leaving your pedal. If you’re going to use it for recording, or if you don’t have a separate EQ unit, it might be worth looking out for a product with EQ settings. How much of a dynamic range do you want? Perhaps you’re after a squashed sound that, although it’s noisy, sounds squashed and under control. Compression allows you to reduce the dynamic range of your signal that can be used creatively to encourage some steady, sustained sounds. 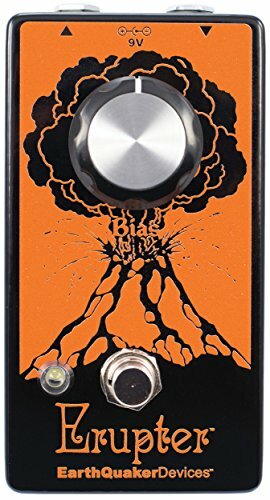 This effect is used a lot in stoner rock (think bands like Spaceman 3, My Bloody Valentine, etc.). You’ll need a tone setting that has an excellent low end, so make sure that emphasizing the bass frequencies is something that the pedal you choose excels in, rather than the highs. It will also need to do be able to do some heavy lifting on the sustain. A few extra controls beyond that of a standard pedal can really work wonders in stoner rock that wouldn’t usually be usable outside of Silent Hill-style industrial horror ambiance. So, now you know what you’re looking for (or not looking for), here’s a round-up of some of the best ones on the market. 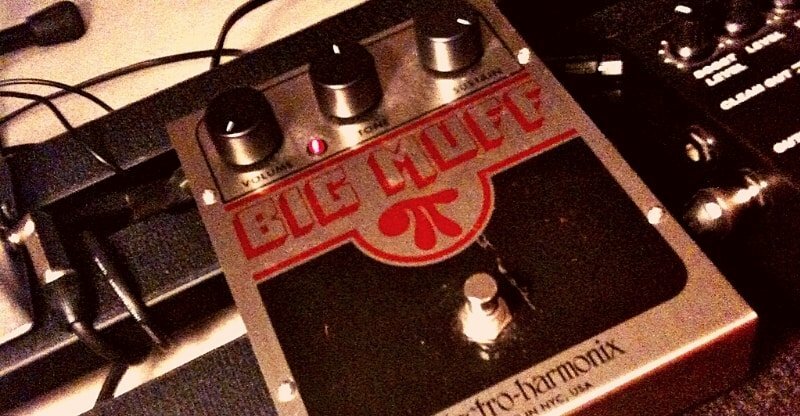 The Electro-Harmonix Big Muff PI is a silicon model that’s been popular since the ‘70s. It has three controls: volume, sustain and tone, allowing you to adjust the output level, lengthen or shorten your harmonic distortion and to alter the how trebly, bassy or mid-heavy your sound it. It’s a simple stompbox which, after the three controller knobs has a simple on/off switch to be controlled with your foot. This thing can take several thousand stomps, as it’s built like a brick, which is probably one of the reasons why it’s so commonly found in touring musician’s pedalboards. The Big Muff Pi can be powered by a 9V adapter or using a 9V battery, making it convenient as well as highly portable. Who is this best suited to? It will be suited to guitarists who want a reasonably priced sustain that’s easy to dial in, and that they can plug into their pedalboard with little fuss. 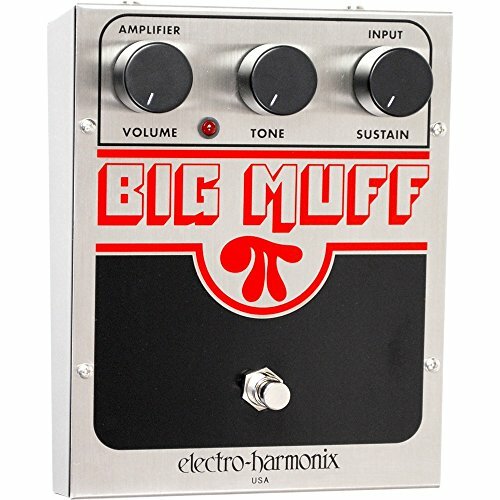 The Big Muff might be less suited to those who require more fine-tuning options. Volume, sustain, and tone controls allow you to adjust the effect to suit your style. Silicon transistors make it reliable and affordable. Doesn’t have the warm tones of germanium-based ones. There are limited tone controls. The Black Arts Toneworks Pharoah Supreme is capable of two modes: silicon and geranium, which is perfect for those who require the harsh, cutting sounds of silicon at times but prefer the warm, vintage tones of geranium at others. It’s easy to shift between the two at the flick of a switch, which is placed between the volume and fuzz controls. As well as being able to modify the output volume and the intensity, there’s also a tone control and a high control. These give you more EQ options than with just one tone knob. There’s a hi/lo input option, too, so you can choose the amount of headroom your guitar has before it clips. You also get a true bypass in this, so you don’t need to worry about it interfering with your sound when it’s not in use, and a 9V adaptor can power it. Who will this best suit? Silicon and Geranium modes give you the option of tight and modern or vintage and warm. Hi/lo option allows you to choose the amount of headroom your guitar has before it clips. Volume, fuzz and tone controls allow you to finetune the effect. All of the different setting options can take some getting used to. The EarthQuaker Devices Hoof is a hybrid silicon/germanium option which takes the best of the germanium layout and makes it tighter and cleaner. It has four knobs: tone, shift, level, and fuzz. As with the other items on this list, the tone allows you to shape your highs, mids or lows, whilst the level controls let you choose how long the sustain lasts for. The shift control works in conjunction with the tone control by setting the frequency response, so you can choose whether it’s highs, mids or lows that you emphasize. It has true bypass, so you can be confident that it won’t make unwanted noises while it’s not in use, and it can be powered off a 9V battery or adapter. 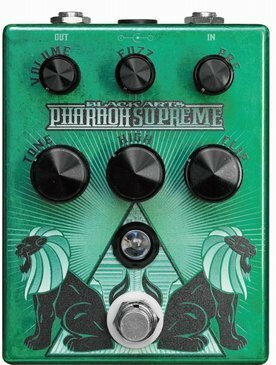 It’s priced similarly to the Pharoah Supreme and offers a smooth fuzz that will suit those who want to maintain the clarity of their notes amidst the noise. It will be less suited to those who are looking for something that’s the ultimate in dirtiness. Hybrid silicon/germanium gives you the best of both worlds. 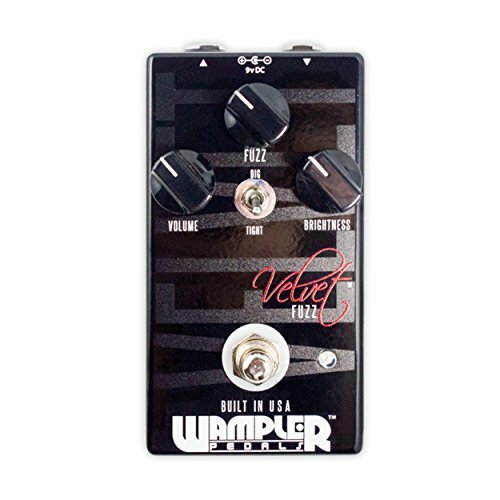 Fuzz, level, shift and tone controls allow you to shape the effect. True bypass means you don’t need to worry about unwanted noise when it’s out of use. Lends itself to a smoother effect, which might not be sufficient for some heavier players. Although there are many controls, there’s no gate or compressor. Germanium only, this has a truly ‘60s vibe and comes with gate, compression, drive and stability controls. The volume controls the output, the drive controls how much distortion you use and the stability controls the pitch of the feedback. 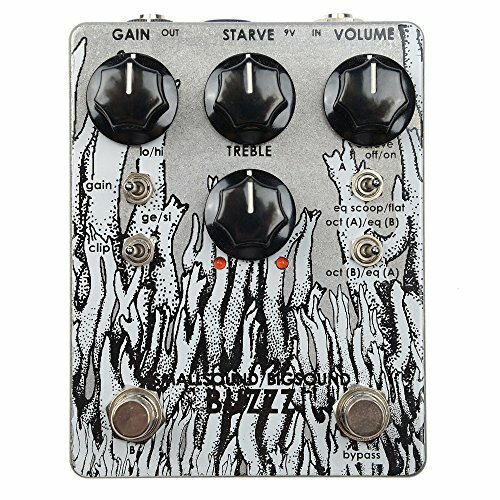 The gate crushes your sound as soon as the sustain has finished, to eliminate any unwanted feedback, and the compression can be used to pinch the tone or to tune in loud, squealing fuzz. It has ‘groovy’ style writing on it, in keeping with the 1960s and can be powered off a 9V battery or adapter, so it’s easy to add to your collection. Who will be best suited to this? It’s a tiny bit pricier than the others here but will be well suited to those who would like to tap into the sound of the ‘60s and like the controllability to make the sound their own. It will be less suited to those who are looking for a brighter, more modern sound. Volume, compression, gate and stability knobs give the pedal excellent controllability. 1960s style design is in keeping with the effect. Germanium transistors offer a vintage tone. Won’t suit those who are looking for a brighter sound. Compression and gate controls can take a bit of getting used to. 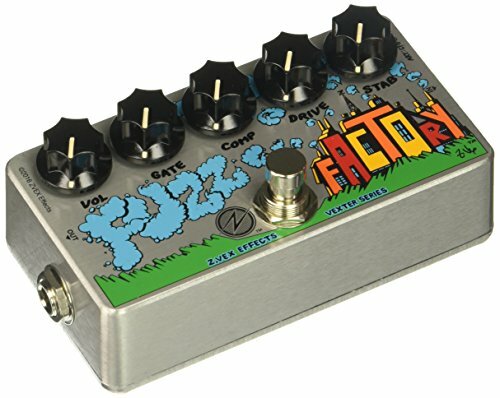 The Small Sound/Big Sound Buzzz is in the same kind of price range as the Fuzz Factory. It can flick between germanium and silicon settings, and also has a hi/lo gain toggle and octave toggles. There are two footswitches, one which turns it on or into true bypass and one which can be set to either tone blast or octave shift, plus there are gain, starve, volume and treble dials filling the bulk of the pedal. The gain controls how overdriven your sound is, the starve adjusts your feedback and the volume sets your output level. The treble dial allows you to shape higher frequencies to suit your style. It’s very versatile which will be highly suited to tech-oriented guitarists who like to get their hands as well as their signals dirty. It will be less suited to those who would like to achieve a dirty fuzz with minimal fuss. Flicks between germanium and silicon, so you get the best of both words. Hi/lo, gain toggle allows you to choose how much headroom you have before the clipping. Gain, starve, volume and treble dials give you control over the shape of the affected signal. Can take some getting used to. Some of the features – like the octave shift – might be excessive to many players. 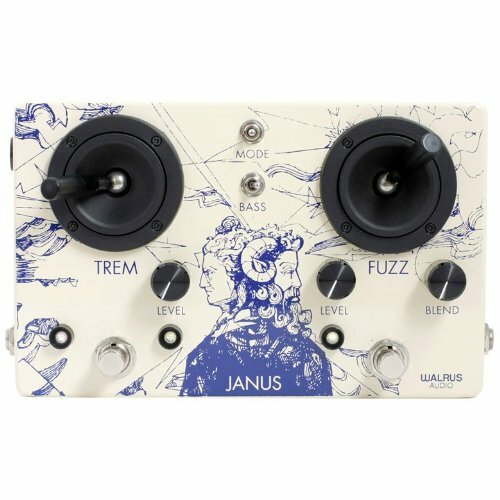 The Walrus Audio Janus is a high-end dual-pedal which doubles up as a tremolo. The tremolo and fuzz are controlled via joysticks, making it fun to use and easy to control. The tremolo joystick adjusts the rate of the tremolo, while the fuzz joystick controls both the amount of fuzz and the tone of your sound. Both of the effects have a level control beneath them, and there’s also a blend so you can mix unaffected signals with your fuzz-driven signal. It can be powered via a 9V adaptor, though plugging the Walrus Audio Janus into a daisy-chain is not recommended. The Walrus Audio Janus is perfect for creative musicians who like to dabble with a variety of effects. It will be less suited to purists who are seeking a signature ‘60s sound. Doubles up as a tremolo effect, meaning even more vintage sounds. Joystick controls are fun and easy to use. Tremolo might not appeal to some. This is a simple germanium product that’s similar in price to the Earthquaker Hoof. It has just three controls: volume, fuzz, and tone as well as the footswitch to turn it on or put it into true bypass, and it’s easy to use. The tone knob changes the timbre of the sound from extremely bassy to screamingly high. It’s a sturdy little unit in a solid metal housing and can be powered by a 9V battery or using a 9V adapter. Which type of player will this suit? It will suit those who want something simple but effective; will be less suited to those looking for one they can endlessly tweak. Controls allow you to shape the effect. Sturdy and simple which you can trust to survive a knock or two. Germanium transistors offer vintage sounds. There’s only one tone knob. The J Rocket WTF is a quirky design with some excellent features. It has a boost, volume, gain, and a ‘WTF’ dial. The boost dial allows you to set a level that you can ‘boost’ to at the click of one of the footswitches. 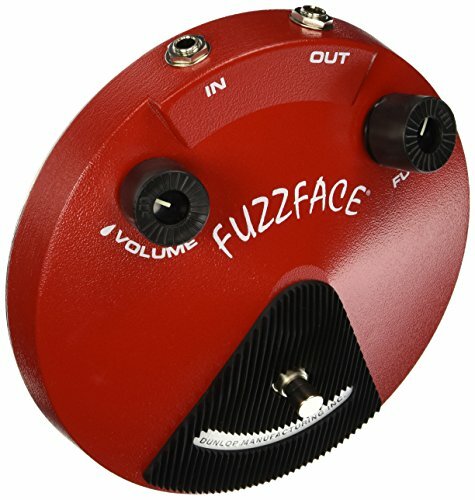 The volume sets the output volume, the gain controls the overdrive and the ‘WTF’ allows you to let things get a little wild (WTF stands for ‘what the fuzz’, and this is the dial where, if you turn it up, you can get some extremely fuzztastic sounds). There’s a toggle to flick between different high frequencies, and the footswitch next to the ‘boost’ control can switch it off, to true bypass. Will suit lead guitarists who might need to crank things up all of a sudden in a solo, and let out some extreme sounds. It will be less suited to those hunting for a signature ‘60s sound. Capable of extreme and more subtle sounds. This product from Dunlop is a very simple germanium option. 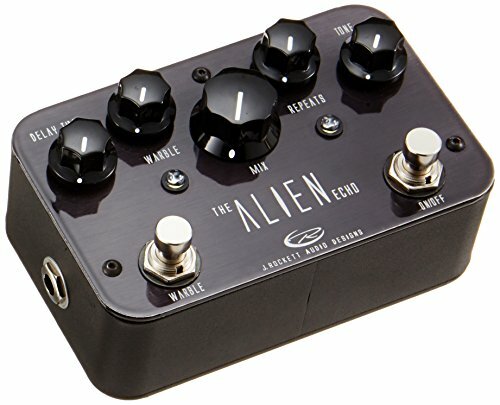 It has a volume control, a fuzz control and an on/off switch, so you can set your output level as well as your effects level and switch the sound off completely. It’s battery-powered only, which is unusual for one of these, but it’s in keeping with its vintage looks, tone, and design. Who is best suited to this? It is ruggedly constructed, in keeping with the originals from the ‘60s; it’s the perfect buy for those who are looking one that will take them back in time. It will be less suited to those who are looking for something modern and technologically controllable. Controls and on/off switch make it simple but effective. Designed just like those of the 60s, so it has a real vintage feel. Germanium transistors give it a warm sound. It can only be battery-powered. A very cool option with the usual controls; but what sets it apart is the inclusion of gate, bias, enhance and even a 3-band EQ. The bias controls takes you from a fat-sounding fuzz to a cleaner, more modern one – and the enhance control gives you yet more control over the shape of your tone. This pedal is powered off a 9V battery or adapter and has true bypass switching. It’s perfect for the guitarist how wants the ultimate control over his/her sound, but who is willing to spend some time figuring out the best settings. It will be less suited to guitarists who are more interested in playing than adjusting their tone, and would rather have something that automatically set itself up for them. 3-band EQ gives you excellent control over the tone of your affected instrument. Volume, gate, bias and enhance allow you to fine-tune the settings. Black cats on the casing. Black cats might not appeal to everyone. 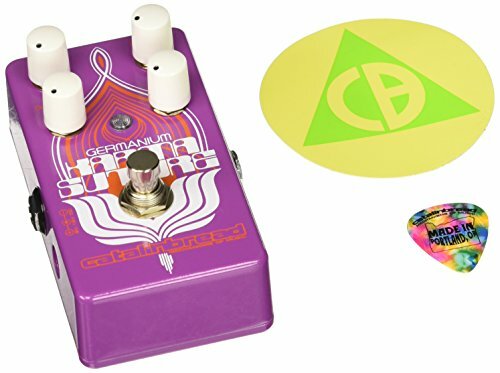 The groovy-looking Karma Suture from the rather bizarrely named Catalinbread is a germanium based pedal. There’s a diodes control, which allows you to set the compression of the diode-clipping from full-clipping and a tight distortion to a spacious, loud sound. A density control, which adjusts your tone from bassy to high and tense, and there are input and output controls. The input controls how much of your guitar goes through it, and the output controls the volume of what comes out. It can be run off a 9V battery or using a 9V power supply and its recommended that you use a battery, as it eats up so little and can also encourage a warmer tone. The Karma Suture is similarly priced to the Fuzz War and the Hoof. It will suit guitarists who want something small to fit into their pedalboards, that’s easily adjustable yet also easy to ‘set and forget.’ It will be less suited to those looking for something more complex, although it is capable of a lot of sounds. The ‘60s design makes it look groovy and is in keeping with the effect. Diodes and density controls allow you to adjust compression and tone. There’s only one tone control. 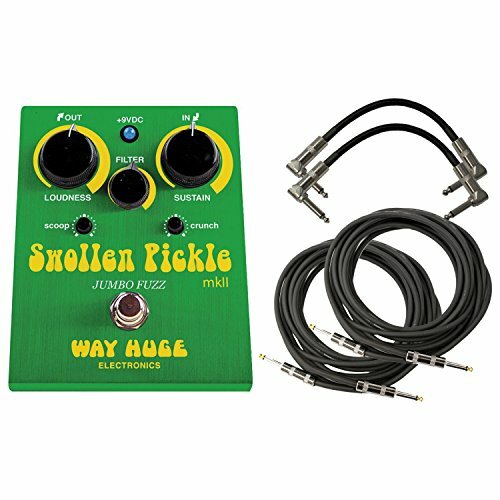 The Way Huge WHE401 Swollen Pickle is a relatively small, inexpensive option with a lot of controls. Loudness, sustain and filter dials, as well as small scoop and crunch dials. The loudness knob controls your output volume, the filter adjusts the range of your heavily filtered tones and the sustain controls how much fuzz will be released. The scoop control adjusts your frequencies and the crunch knob alters the compression of the sustain. Its got true bypass, so when you flick the footswitch ‘off’, you don’t need to worry about unwanted humming sounds. It can also be powered by either a 9V battery or adapter. The Swollen Pickle will suit guitarists who want some high-gain sounds and want a level of controllability over them. It will be less suited to those hunting for a classic ‘60s replication as the transistors are silicon and the controls are more advanced. High, crunchy sounds thanks to the silicon transistors. Scoop and crunch dials adjust frequencies and compression. Loudness, sustain and filter dials enable you to fine-tune the effect. Scoop and crunch dials are tiny. This is a versatile little number with volume, fuzz and brightness knobs as well as a big/tight toggle. The big/tight toggle uses its own two completely different clipping options, which work similarly to but are not the same as germanium/silicon transistors. and its capable of vintage tones as well as noisy, newer tones. It’s completely true bypass, so you don’t need to worry about the it muddying your signal, and as they’re hand-built in the USA so you can expect quality. They are powered off 9V batteries or adapters, and they’re small enough to slot into your pedalboard. This is suited to musicians who are open to experimenting and want easy access to a wide range of tones. It will be less suited to purists who require geranium transistors and ‘60s simplicity. Big/tight toggle gives you access to a wide range of sounds. True bypass means you don’t have to worry about a muddied signal. Tone controls are limited to one ‘brightness’ dial. If you’re looking for something that’s true to the ‘60s, Death By Audio’s pedal is the most alike to original models, with its three controls and the circular design. The ZVEX Fuzz Factory and the Karma Suture are also designed with the ‘60s in mind, and they have both germanium transistors and ‘groovy’ design-work to match. Those who are looking for one which can give you a vintage, warm sound, but also achieves the clarity of silicon transistor pedals, are likely to be impressed by those hybrid options that offer both. The Small Sound/Big Sound Buzzz and Blackarts Toneworks Supreme both have switches between the two types of transistors, and the EarthQuaker Devices Hoof is made from hybrid circuitry which offers you the best of both worlds. If you’re looking for something simple, that’s built like a brick; you need look no further than the Big Muff Pi. This pedal is legendary for many reasons, one of them being that it will last you forever. The Old Blood Noise and J Rocket WTF offer some additional controllability options like gate, compression and boosting, and the Old Blood Noise even includes a 3-band EQ. If you require extra effects, the Walrus Audio Janus has an included tremolo which can really offer the sounds of vintage amplification. Whichever of these is right for you; we hope that the reviews here have helped you on your journey to finding some out-of-this-world sounds.